Nice reviews. Thank your wife for us Svend! Svend: Any adverse feelings in the knees when skiing the wider skis? Have you tried "the Crush" yet? Your wife is the same weight as my friend liz and the crush kinda of splits the difference between the BMx98 and Century. 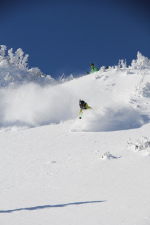 another option is the Female Cochise coming out in a 170cm if you concerned about harder snow and quad. Hey Svend...nice job....you actually were able to tie her down long enough to illicit this info...good on ya! My thought is that the 160 length in the MX78 is probably the right lenght for her having watched her ski it....albeit the condtions for out west might have been better for the longer length...but for most easter and western conditions where she looks to make lots of tight turns...the 160 IMO would be the better choice. I think like Bush stated....the Crush could be a sweet choice for her to demo. Still I think given her current quivver, her next ski purchase will be a hard snow ski I'm guessing. I think you'll need to build a storage shed out back to support your familes ski collection! ....yes...WE need that fix for sure! AND...what will you be trying Turbanator? BTW....the tail rocker on the Crush I think is pretty minimal....had the same thing on my Rossi S3's and it was not a mushy tail. I think if you check out RS site...the Nemesis is tail and tip rocker also. do not judge a ski by one attribute. The entire ski on the Crush/One engages its the best carvers out of 98mm group by far even better than the bonafide. Not that Nastar is a great indicated of ski performance while IMO it since I run the same course all the time. I handicap between 8-10 on my "the ones" which is solidly in Gold for my pretty hard age group I need to run my GS skis to Platnium If you have issues with edge grip from the tail rocker the issue with you and not the ski. but in reality the fact I can do that on those skis is meaningless because noone is buying the one to rip groomers or race nastar on or ski icey bumps. Your only going to be using the skis to have fun in soft snow which it does very well at while still ripping groomers pretty damn well. I hate to say this, but your wife is aft in all those pictures. 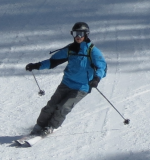 Tail rocker can actually correct that as it forces you to ski centered. and also I checked out a pair of BMX98 last night and they for sure have tail rockered to be fair it is a more stable and more damp ski than the crush at the expense of a longer turn radius and being much less playful in bumps and trees bu roughly the same in powder. I have skied the BMx98 in a 178 and have skied the the crush/the one in from 170,177,184 and own the 177.
hey sorry for doing that. did not mean to point that out just from my own experience of being a once very aft skier(much more aft than your wife) that rockered skis did not agree with me at first. IN 06-08 era i expressed my displeasure with them quite a bit mostly due to my balance not being great. Now there is no way I would not recommend a ski with tip and tail rockered for off trail skiing, especially for people skiing tight spots. 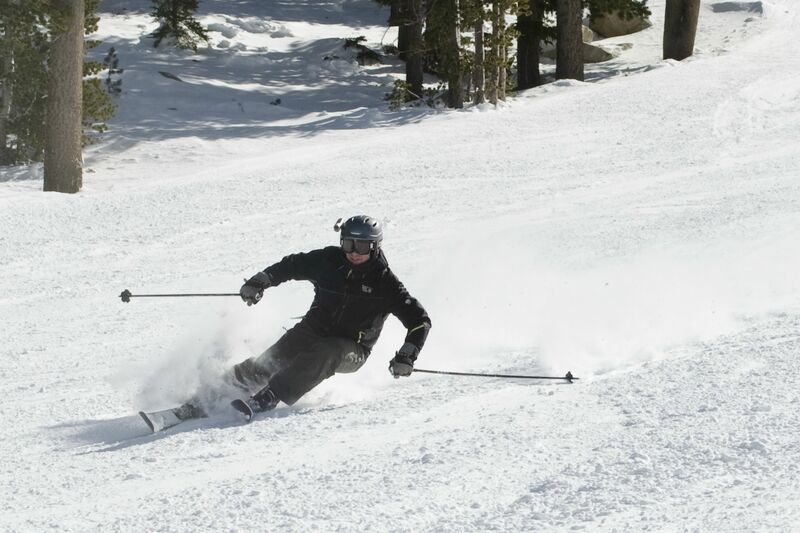 Skiing a fully rockered skis on hardpack well is one of the best way to get amazing balance from all angles they do not forgive getting really forward or really aft and you need great tipping skills to engage the entire edge. It's a real shame that Blizzard is eliminating The One/Crush from their lineup for 2013. IMO, that's a ski you should grab while it's still around. A rockered ski that fat shouldn't hold an edge and ski groomers as well as it does while still slaying the off-piste terrain. Segbrown (from Epic) skied a bunch of the 2013 Blizzard female skis over the past week and although she had good things to say about quite a few of them, she still went back to her Crushes when the going got "tough (cut-up and crud). I have to agree with Josh here on how skiing a fully rockered ski on hardpack forces you to ski very centered. These skis can provide some great feedback on how well you're controlling your fore/aft balance or if you possibly have some fore/aft alignment issues that you need to work out. For the heck of it we took some shots at Mt. Rose of skiing our big rockered skis on a groomer. I'm on a 110mm underfoot, flat camber, rockered tip & tail ski in this shot. It takes some serious concentration to work a ski that big into higher angles. the replacement to it is going to be much better with no more female verison but a Ti and Carbon verision, all made with flipcore. Should be much lighter, have the flipcore magical grip on hard snow and still be as nimble as the old ones. Only problem is we have to wait a year. I have owned the 177 and just ordered another pair of the same. Josh - Which ski do you consider the "replacement"? I'm not recalling anything upcoming that's really like The One at all. At my wife's request (and I concurred) I have removed the original post, all pictures, and all of my subsequent replies. My apologies to anyone who may have found the reviews helpful.